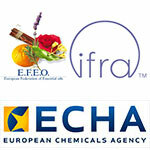 ECHA announces that the European industry associations for essential oils have published new guidance to help industry to fulfil their obligations under REACH and CLP. This is the result of intensive work by stakeholders, in consultation with ECHA, to establish practical solutions for the identification of this specific group of substances. Essential oils are derived from various sections of plants and are obtained by distillation, steam distillation or expression. They are complex substances that may warrant a tailored approach to their identification. Several factors such as the region of growth, the climate within the region, the part of the plant used as source material and the process applied lead to natural variations in their chemical composition. Their complexity varies widely from simple substances with only few constituents to very complex ones with more than 100 constituents. These new guidelines have been prepared by EFEO (European Federation of Essential Oils) and IFRA (International Fragrance Association). The purpose of this document is to guide potential registrants of Natural Complex Substances (NCS) in determining the chemical identity of their substances for registration, classification and labelling and safety data sheet purposes under the EU REACH and CLP Regulations. It aims to provide a simplified set of guidelines to identify Natural Complex Substances (NCS) for REACH and CLP purposes. This sector-specific guidance on substance identification complements the official ECHA guidance on the same topic. The European Commission will translate this guidance into selected EU languages. Translations will be made available in the last quarter of 2015.